Imagine an Italian meal full of fresh basil and zesty spices that’s low-carb, gluten-free, vegan, and completely nutritious. And, importantly, it also tastes delicious. That’s what you’ll get from this one-pot pasta dish, which will help you feel warm and cozy without the guilt of refined flour noodles and saturated-fat-laden cheese. This healthy eating recipe is one part convenience, one part comfort food, one part healthy, and 100 percent satisfying. If you put a bowl of traditional pasta next to a bowl of zucchini noodles, there’s a big difference in measurable carbs. The pasta will rack up some 100 grams of carbs while the zucchini noodles will total only about 6 grams. 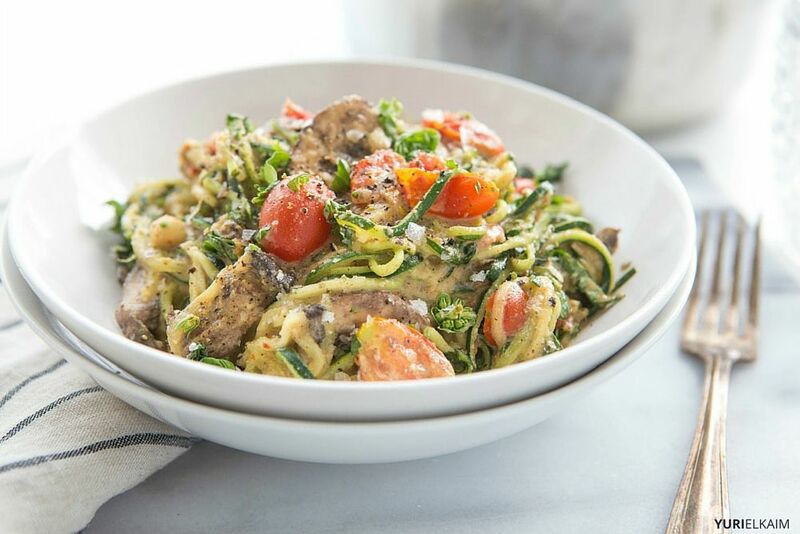 So if you’re limiting your carb (or calorie) intake, zucchini noodles are the sure winner. Another reason to steer clear of gluten? It may cause tiny holes in the intestinal wall due to inflammation, allowing allergens and toxins to leak into the bloodstream and affect your overall well-being. Gluten also exacerbates symptoms in those with irritable bowel syndrome. 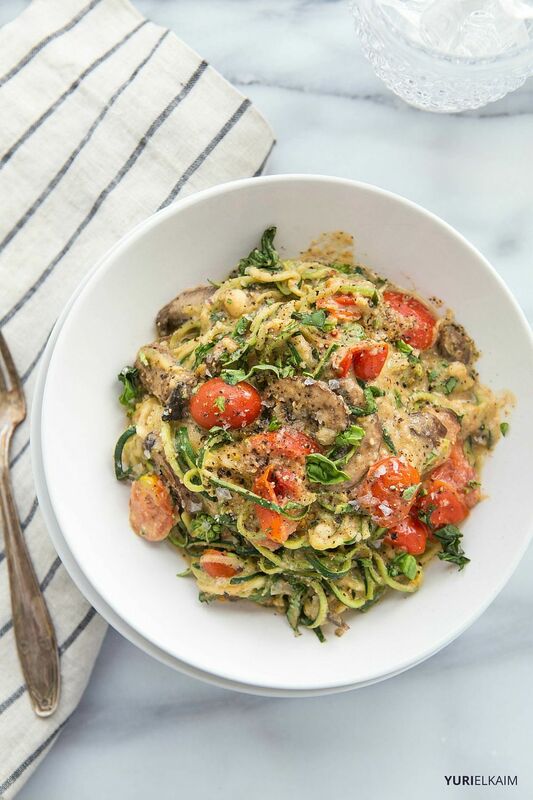 Even if you’re not plagued by stomach issues, if you swap out regular pasta for zucchini noodles you’ll get an extra serving or two of veggies, and we can all benefit from that. Zucchini is low in calories, yet it’s packed with vitamins A and C as well as fiber. The fiber is both filling and excellent for digestive health. The vitamin C in the zucchini gives your immune system a boost, and the vitamin A is great for your eyes and skin. Looking for an alternative to zucchini? Try sweet potatoes in this one pot wonder tomato basil pasta for a fun change of pace. This recipe calls for using a “spiralizer” to make the noodles. If that’s a new tool for you, there are dozens of spiralizers online, and lots of product reviews, as well, which may help you in selecting the best spiralizer. 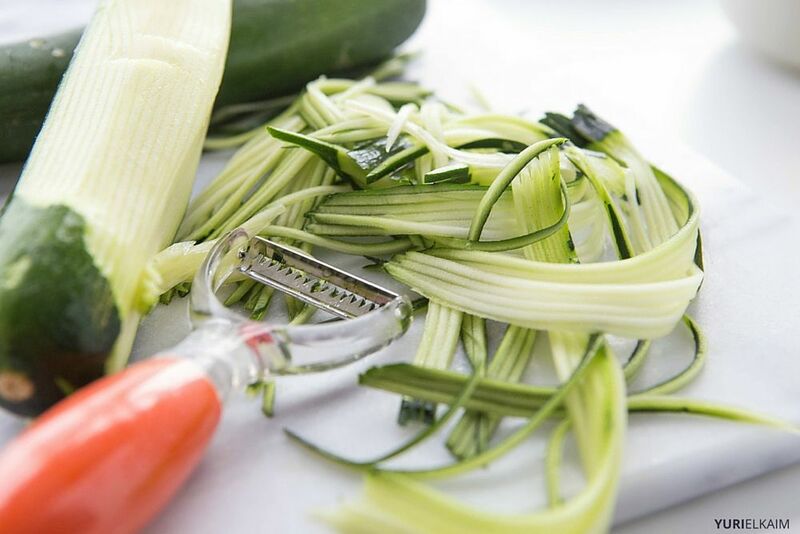 But from my experience, a hand-held julienne peeler also works as an effective “zoodle” maker. And you can typically buy them online for less than $10. Even if you’re not vegan, you’ll love the nutty, cheesy flavor of nutritional yeast. It’s akin to parmesan cheese, but without the dairy, and with many benefits to your health. Nutritional yeast, which can generally be found in health food stores, is a deactivated yeast grown on beets and dried, and is not related to the harmful yeasts that can wreak havoc on your body. When possible, choose flakes over granules, since they have a milder flavor and more versatile texture. Nutritional yeast is rich in vitamin B12, which is critical for production of red blood cells and for producing myelin, the protective insulation surrounding your nerves. Vitamin B12 is typically found in meat, fish, and dairy products, but vegans can get vitamin B12 from nutritional yeast. It’s also a complete protein, so you’ll get a boost for your brain, body, and muscles. You’re going to love the umami flavor it gives to this “pasta” meal. You'll love this Italian meal full of fresh basil and zesty spices that’s low-carb, gluten-free, vegan, and completely nutritious! In a small food processor or high-speed blender, combine olive oil, garlic, brazil nuts, nutritional yeast, sea salt, Italian seasoning and red pepper. Pulse until the consistency of pesto sauce. Transfer sauce to a large pot. 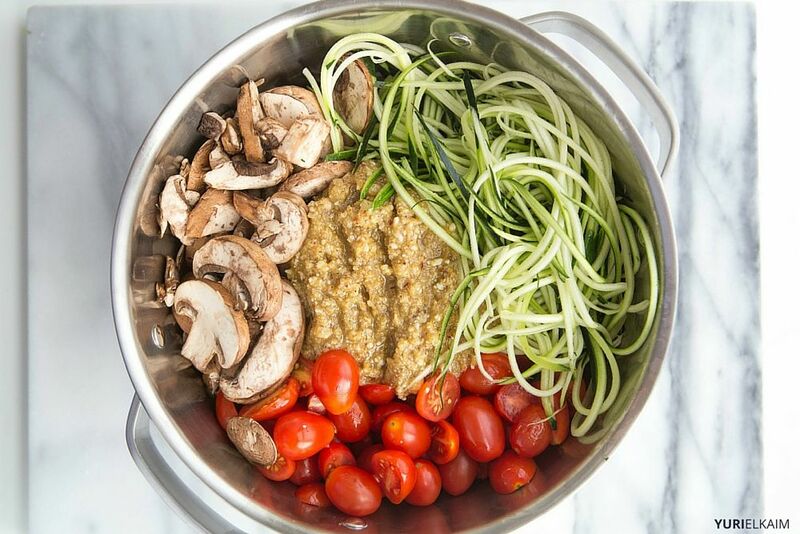 Add spiralized zucchini “noodles," mushrooms and tomatoes. Cook on stovetop over high heat, tossing every 3-5 minutes with tongs, until the noodles begin to wilt and pot starts steaming (about 10-15 minutes of cooking time). Garnish with fresh basil and fresh-cracked pepper. Enjoy! Love recipes like this one pot wonder tomato basil pasta, that make your tastebuds and your tummy happy? Check out my free “All-Day” Energy Diet Community Cookbook. You’ll get 67 delicious, allergen-free meals that take less than 15 minutes to make for FREE by clicking on the banner below.